Expected to be live in 2015. Check out for events of the time. NDM News. NDM Documentaries. Talk Shows. Entertainment and Sports. Live recording is our Business. NDM keeps you informed and entertained. You can choose subjects to view and News to Listen to. NDM Live recordings. Now make productions for Prime3Media Programs for FAITH TV. 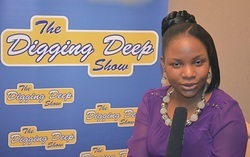 THE DIGGING DEEP SHOW.